Preheat oven to 180ºC/ 160ºC fan-forced/ 350ºF. Wash the chicken inside and out with cold running water and pat dry with paper towel. Place it in an ovenproof dish. Fill the chicken cavity with fresh thyme and then tie the drumsticks together with kitchen string. Lightly spray bird with oil then season the skin with salt and pepper. Place in oven and bake until the chicken is cooked and juices run clear when thigh is pierced with a skewer. (See cooking times below). 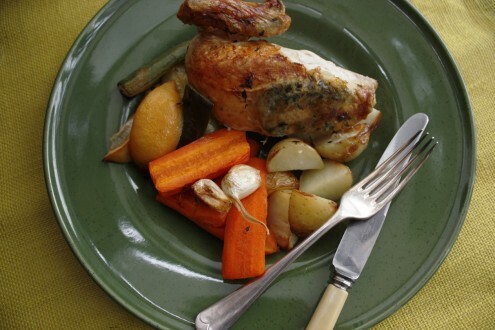 Baste periodically by carefully spooning juices back over the chicken. Leave chicken to stand for 5 minutes before carving to let the juices settle. Serve with additional steamed or blanched green vegetables such as zucchini or green beans. To remain within the carbohydrate allowance, only serve the equivalent of 100-200g/ 14 ounces of potato per person. Cooking times: My go-to guide for cooking meat, (The Commonsense Cookery Book) says to allow 60 minutes per kilogram of chicken when roasting. So check the weight of your bird. Interesting fact: Did you know baked potatoes or cold potatoes (as in a potato salad) have a lower GI than mashed? Hi darling sis! Hope you liked it. This recipe is fool-proof, I make it nearly once a week it’s so dependable & takes 10 mins to prepare. I usually use a nice 1.2kg organic bird. Love this recipe!!!! So simple. Even good to pop in slow cooker if your afternoon is manic and don’t have time to prepare then! I don’t use a slow cooker (yet) but would never have thought of doing this kind of recipe in one. Thanks for the tip. I LOVE this recipe! I made it with sweet potato – my understanding is that it’s a lower GI option than white potato – is that correct? Anna – yes that’s right. Sweet potato/ kumera/ yam, is a lower GI option.